abcreads: One Block, Nine Maps: Are You Ready For the Map Festival? One Block, Nine Maps: Are You Ready For the Map Festival? Compass Rose from map of sewer system, 1890-1892? A guest post written by Eileen O’Connell, Branch Manager of Special Collections. 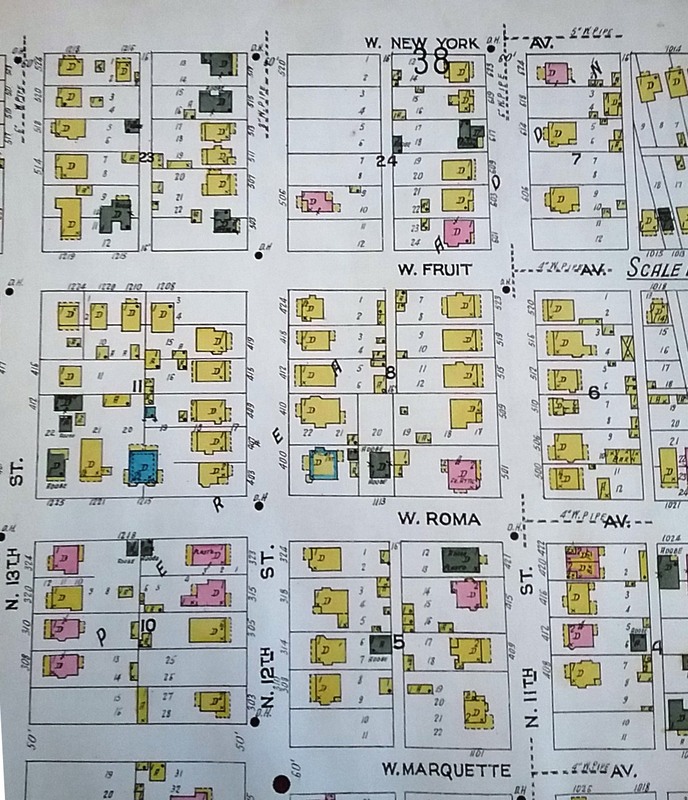 To celebrate our rapidly approaching map festival, we thought it would be fun to trace the history of one city block using nine maps. To orient the contemporary view, take a look at the 2016 aerial map of the 500 block of 12th Street NW. 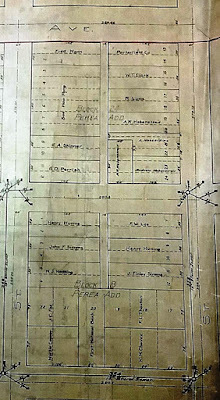 The block is block number 24 of the Perea Addition, bounded by Lomas Boulevard on the north, 11th Street on the east, Fruit Avenue on the south, and 12th Street on the west. 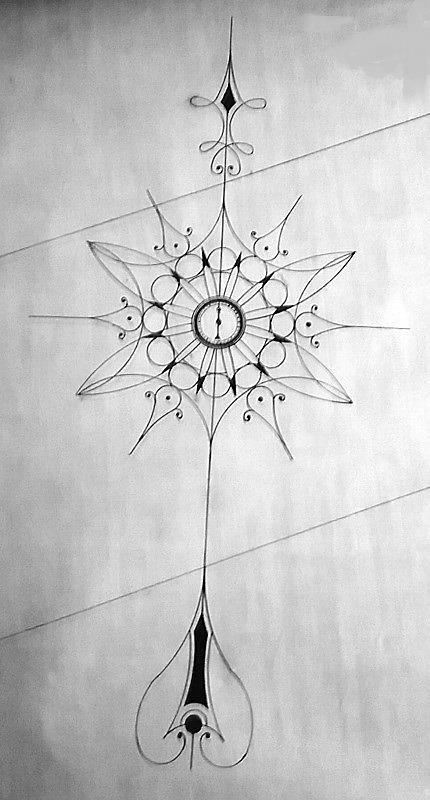 The number superimposed over the structures are address numbers. 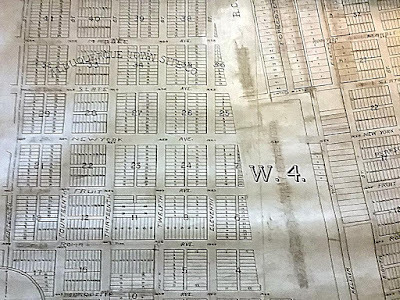 The earliest map we have at Special Collections that clearly shows this block was published in 1889 and was compiled by the Real Estate Title Insurance Company of New Mexico. 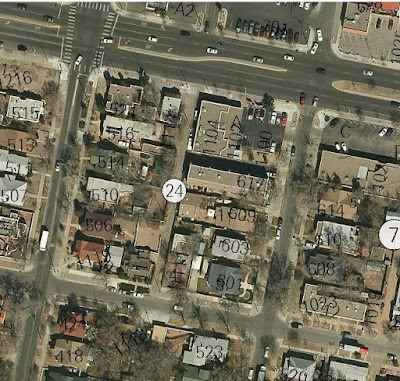 It labels the block as block 24 of the Albuquerque Town Site Co. Addition. 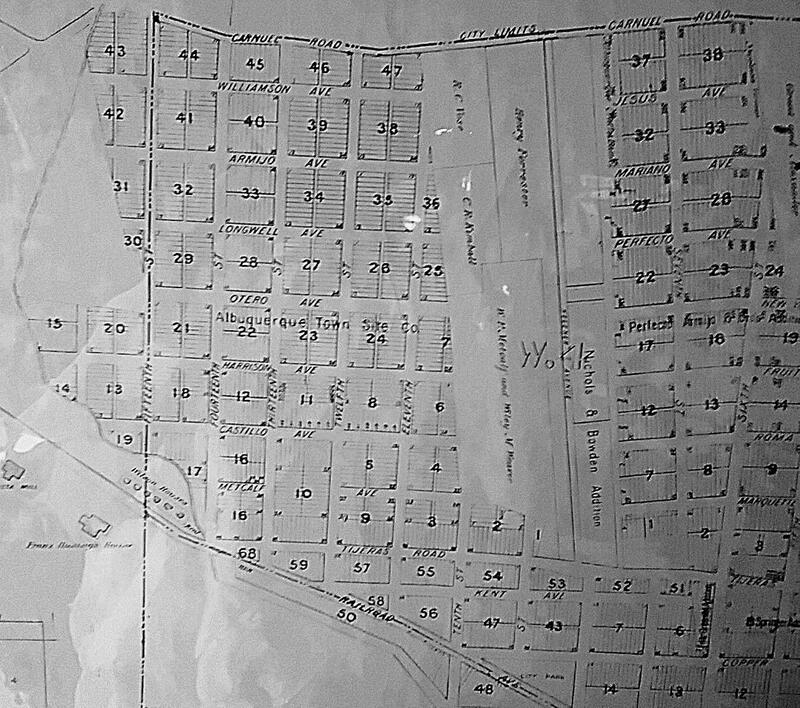 Of the north-south streets visible in this photo, only Tijeras's name remains unchanged. Block 24 is bounded north and south by Otero and Harrison avenues, respectively. The W.4 designation refers to the Fourth Ward, a political boundary for the voting and school district. 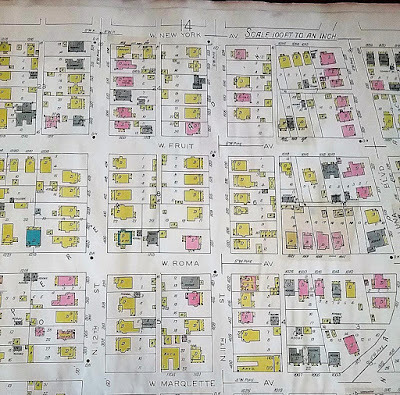 This map is one of a set of maps produced by H. D. Johnson and Edward A. Pearson that show the layout of Albuquerque's Sewer System. It is also a puzzle for the researcher. We estimate it was produced between 1890 and 1892. An April 18, 1891 article in the Albuquerque Weekly Citizen takes citizens to task for "indulging in adverse criticism" of the contractor tasked with building the system. Johnson is listed in the 1892 Albuquerque city director as an architect. 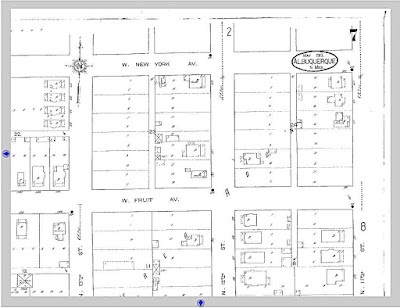 The 1892 city directory also shows that the north-south street names are now New York Avenue and Fruit Avenue. 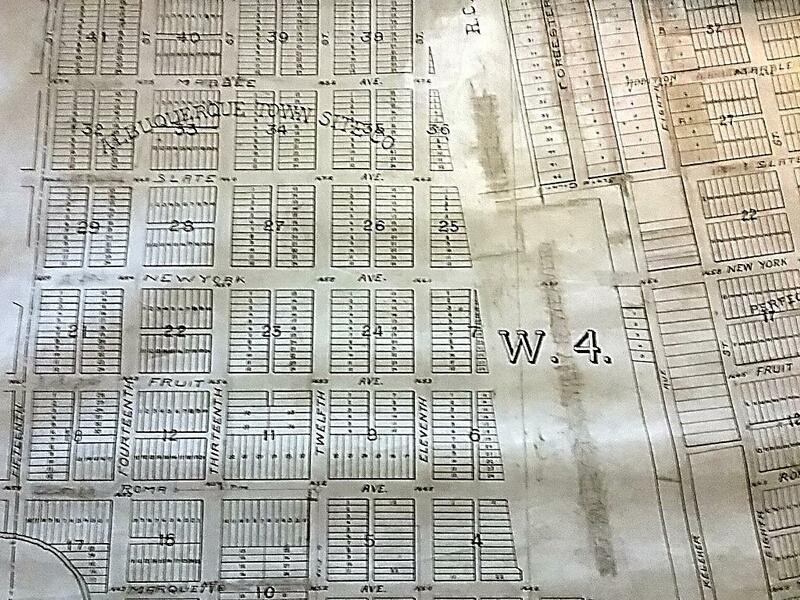 Real estate records show that Block 24 of the Albuquerque Town Site Co. 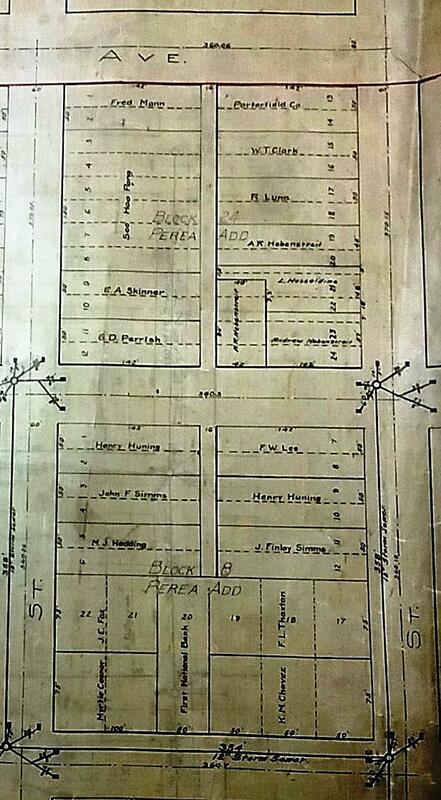 Addition became block 24 of the Perea addition in 1900. Although block 24 of the Perea Addition is shown on the index sheet for the 1908 Sanborn map, this map from the Sanborn Maps eResource is the first to show the block in detail. 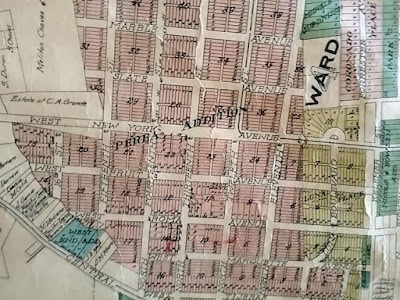 Thomas T. Skinner is listed in the 1913 city directory as a resident in the dwelling on lots 9 and 10; his occupation is listed as manager of the family's grocery store. Although the 1920 map compiled by J.F. 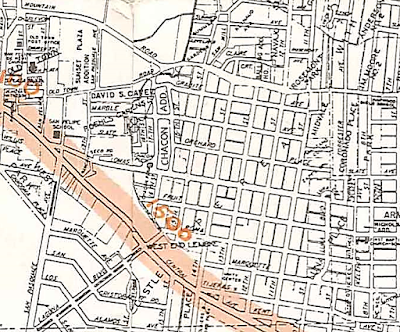 Brozo for the Albuquerque Title Guaranty Co. is more colorful, the 1920 sewer map is more interesting. The sewer map lists names of property owners to be assessed for sewer extensions and improvements. Amid the familiar Albuquerque names on block 24 and block 8 (due south) are Huning, Hebenstreit, Luna, Mann, and Simms. Running crossways along the west side of block 24 across lots 3-8 is the name Soo Hoo Pong. 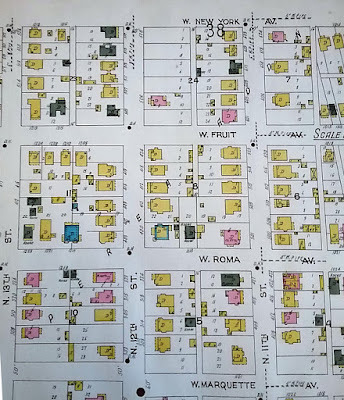 The exclusion laws severely limited Albuquerque's Chinese population, but brothers Soo Hoo Pong and Soo Hoo Nong and business partner Ah Kee were well known as proprietors and managers of the Los Angeles Restaurant at 217 West Central. The Records indicate that the brothers were real estate investors as well. 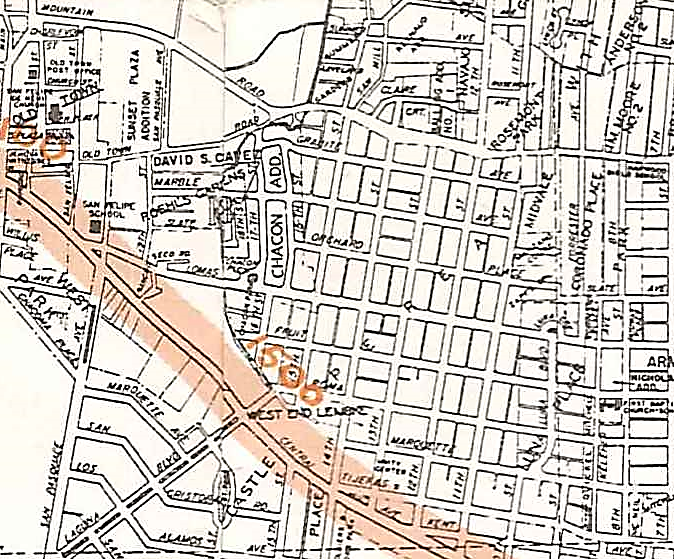 The 1924 and 1931 Sanborn Maps show rapid development on the west half of block 24 in the six year interval between map editions. The scale for both maps is 100 feet to 1 inch, "D' over the outline of a structure indicates "dwelling." 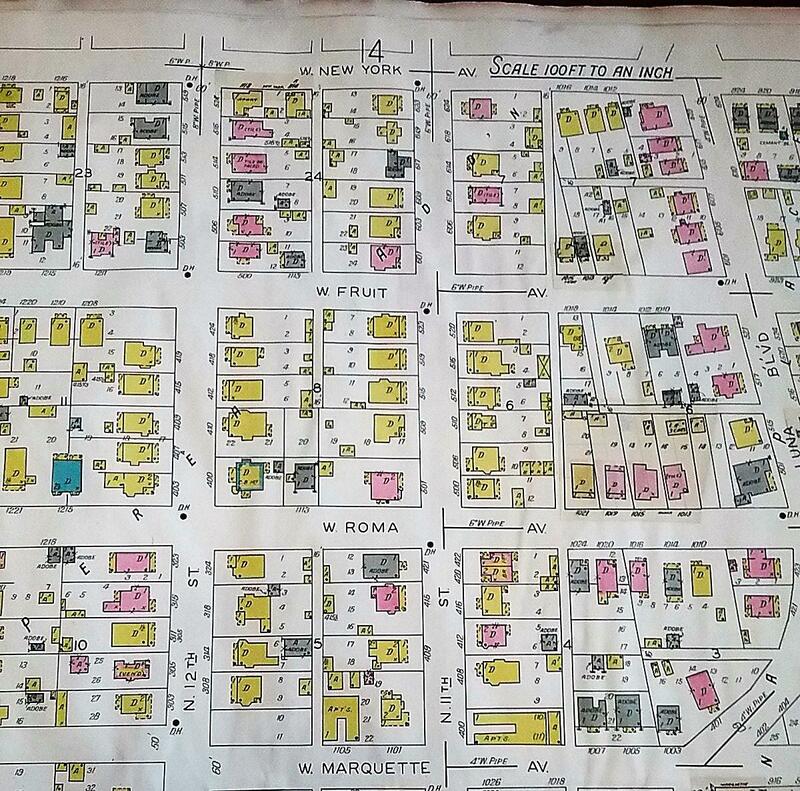 Although it doesn't label lots and blocks, the 1952 First National Bank map of Albuquerque still references the Perea Addition. 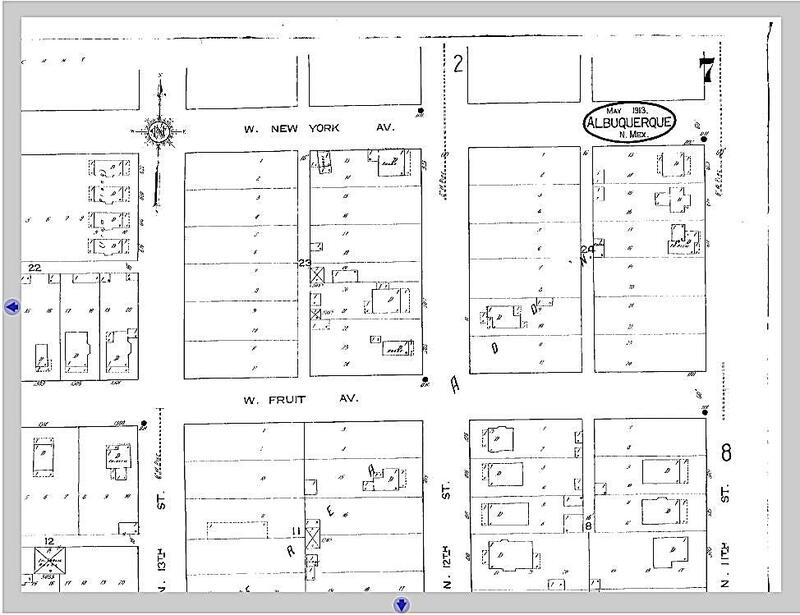 It also shows the new name and new alignment for the former New York Avenue. 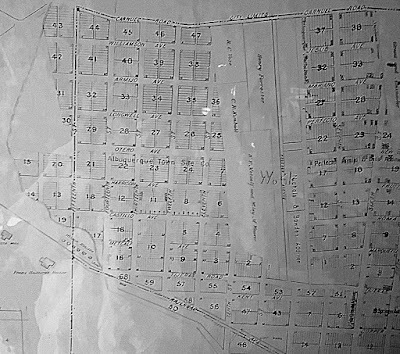 Lomas Boulevard was the result of a street realignment that affected New York Avenue, Las Lomas, Campus Boulevard, and the Menaul Diagonal. The realignment was part of a larger traffic plan for Albuquerque which was accompanied by several street name changes and the shift to the quadrant system that divides Albuquerque NE, NW, SE, SW along the Central Avenue and Railroad Axes.